As of February 28, the City’s bank balance was $37,364. A plat is not required when a person makes a conveyance of one or more tracts, each of which is two acres or more in area, to members of his or her immediate family for their personal use; provided, however that each daughter tract is either located on a public road or has access to such a road by a private easement. However, if the family member sells the land to a non-family member within two years, it will be presumed that the conveyance was not for personal use. The legal firm with which the City had an agreement for the provision of legal services split up into two firms. Mayor Piper recommended that the City sign a new agreement with Barney Knight’s firm (Knight & Partners) because of the lower cost and Coupland’s previous experience with Mr. Knight. The new agreement was approved. The Mayor reminded the Aldermen that the new City sales tax of 1.25% will go into effect on April 1. The City Council set a tentative date for Saturday, May 17, for a city-wide clean up day. Details are pending but it may include a large dumpster for city residents to use. The Council hopes to be able to make an announcement in the next issue of the Coupland Herald. The Council also discussed the possibility of arranging for mowing along certain roads, including County Road 458 but not including the state roads that go through Coupland. Mayor Piper and Eldridge Tidwell will gather information for possible future action. A potentially major development for the future of Coupland was the adoption of Resolution No. 2014-2-13-02: “A Planning and Zoning Committee is to be formed for the purpose of examining zoning possibilities in Coupland. The committee will consist of Cole Barton, Sarah Torluemke, Loretta Patschke, Tim Worthy, Carolyn Haverland, Peter Wabbel, and Tanya Suchomel. The Mayor will convene the initial meeting.” Mayor Piper said he had previously contacted these citizens and that they had agreed to serve on the committee. He said that they will elect officers, look at what other cities are doing, get input from the public, and make recommendations to the City Council. Concerns were raised by various Council members, and one of the meeting attendees, about things like pig farms, waste management facilities, adult book stores, hazardous waste dumps, sludge farms, or a feral hog slaughterhouse being established within the city limits in the absence of zoning regulations. One Council member pointed out that there were state and county regulations that would apply in some cases. Possible zoning categories such as residential, commercial, mixed, and agricultural were mentioned at various times. One of the potential members of the committee, Sarah Torluemke, offered this explanation of how zoning would work in Coupland: “From my perception, it’s not so much to dictate to people what they can do. It is to offer a mechanism for guiding the growth in Coupland.” In commenting about the opposition to zoning previously expressed by Jim Huntington, Torluemke said, “From his perspective, he’s afraid that it will change Coupland and in my head the purpose for having some kind of zoning is to keep Coupland from changing in ways that we don’t want.” Alderman Schmidt said that in the past, Coupland was a more cohesive community and that community standards were different. She said, “Unfortunately, that’s not the case here any more . . . ’cause we’ve got so many rental properties and we’ve got other people moving in . . . The way people are now, today, you can’t rely on them to want to do the right thing . . . They want to do what’s right for them but not what’s right for the community.” How zoning might be enforced was also a subject of discussion as were the granting of variances. The resolution passed on a vote of three in favor of the resolution (Barbara Piper, Susan Schmidt, and Eldridge Tidwell ) and one opposed (Karen Marosko). Mayor Piper noted that the meetings of this committee will be subject to the provisions of the Open Meetings Act and will be publicized. During the citizens and events recognition portion of the meeting, Susan Schmidt praised the speaker at the general meeting of the Coupland Civic Organization, Dr. Dana Boehm, who talked about her travels to Africa and her efforts to promote sustainable living concepts. No citizens signed up to address the Council. The next meeting is scheduled for April 10. This entry was posted in Local Government, What's New? and tagged city council, City of Coupland Texas, Coupland City Council, Planning & Zoning Committee, zoning on April 2, 2014 by Stewart Dale Spencer. This entry was posted in Local Government, What's New? and tagged city council, Coupland Texas on July 22, 2013 by Stewart Dale Spencer. 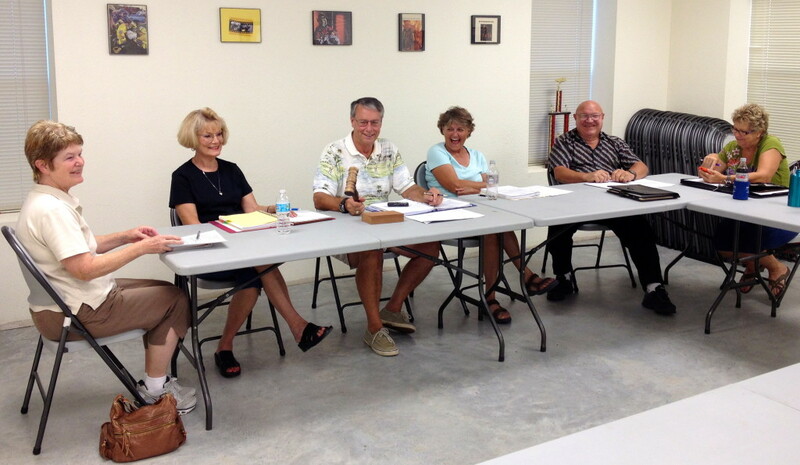 This photo is from the June 11 meeting. L-R is Susan Garry, Barbara Piper, Jack Piper, Karen Marosko, Susan Schmidt, and Eldridge Tidwell. CORRECTION (JULY 20, 2013) – With regard to the decision to establish a committee to work on a budget and make recommendations to the City Council (the 7th paragraph below), the Open Meetings Act does not apply in this case because the committee is less than a quorum of the council and is advisory in nature. Their work will be presented to the City Council in a future meeting. City Council meeting notices are posted at least 72 hours in advance. At this time, notices are posted at Citizen’s National Bank, the Post Office, the Fire Station, and in this publication. After the Call to Order, the minutes of the first regular meeting, held on June 11, were approved. A resolution to establish the fiscal year for the City was approved. The fiscal year will begin on October 1 and end on September 30 of the following year. Linda Orrick, Senior Field Servies Representative of the Texas Municipal League Intergovernmental Risk Pool, presented information and answered questions regarding a proposal to purchase coverage to protect the City from loss related to worker’s compensation claims (which includes elected and appointed officials), general liability, law enforcement liability, errors & omissions liability, auto liability, auto medical payments, public employee dishonesty, forgery or alteration, theft, disappearance & destruction, and computer fraud. The proposal was specifically designed to protect newly incorporated, small cities. After questions from the Aldermen and further discussion, a resolution to purchase the coverage was passed. There was a short recess to take care of some paperwork related to the transaction. When the meeting resumed, Karen Marosko presented information related to a city franchise tax. Mayor Piper also shared some information. No action was taken at this time as research is ongoing. The City Secretary (yours truly) presented information regarding the establishment of a city website and related components such as official email addresses and online folders for the purpose of sharing documents. The Aldermen passed a resolution authorizing the City Secretary to proceed. There was a discussion regarding the development of an initial city budget and potential sources of revenue. A city sales tax proposal would be on the November election ballot. Al valorem tax rates must be set by mid-September. The Aldermen decided to form a committee to work on the budget and report back to the Council with their recommendations. Mayor Pro-tem Barbara Piper will convene the first meeting. The meetings will be open to the public and will be announced in advance. The Aldermen approved a resolution authorizing the Mayor to purchase supplies and equipment for city business, not to exceed $300. There was a discussion with regard to a resolution authorizing the City to reimburse elected and appointed officials for reasonable costs associated with attending the Texas Municipal League’s 2013 Newly Elected Officials’ Orientation later this summer. Barbara Piper summarized the City’s current assets and liabilities and pointed out that the City is not allowed to engage in deficit spending. In short, the City could not afford to approve the resolution. The resolution was not approved. Individuals are free to attend at their own expense. No one signed up to speak to the Council. The next meeting will be on Thursday, July 25 at the Coupland Fire Station at 7:00 PM. The meeting may be canceled if the agenda items can wait until the first meeting date in August. This entry was posted in Local Government, What's New? and tagged city council on July 12, 2013 by Stewart Dale Spencer. 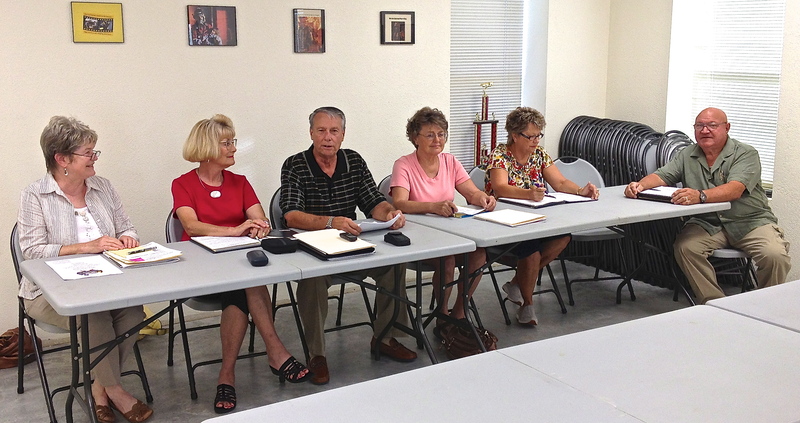 The initial meeting of Coupland’s first city council was held on Tuesday, June 11 in the meeting room of the Coupland Volunteer Fire Department. 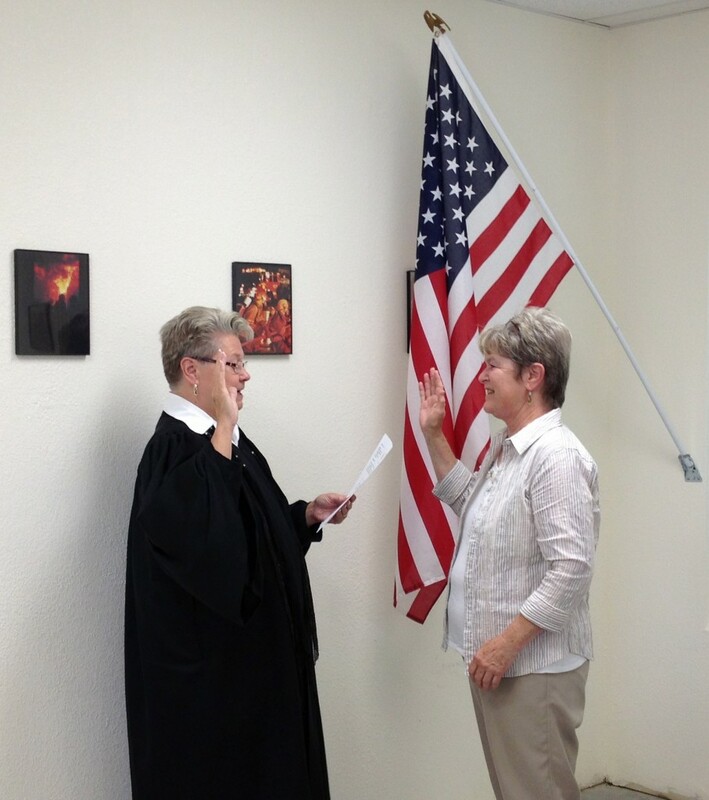 Just prior to the meeting, Judge Judy Schier Hobbs (Justice of the Peace, Williamson County Precinct 4) administered the oath of office to Susan Garry, who had been away on family business at the initial swearing in ceremony. Susan Garry takes her oath of office. Judge Hobbs said she was very happy to be able to be present to witness the calling to order of the first city council in Coupland. I asked her when was the last time that a city had incorporated in Williamson County. She said that it had been quite some time and that she believed that it was the City of Wier in the 1980’s. Attendance by the public was light but this initial meeting was devoted primarily to administrative matters. The meeting was called to order at 7 PM. Mayor Jack Piper calls the first meeting of the new city council to order. In other matters, Barbara Piper was elected to serve as Mayor Pro Tem. Karen Marosko and Susan Schmidt drew the long straws, figuratively speaking, and will serve two-year terms. The other Aldermen (Barbara Piper, Susan Garry, and Eldridge Tidwell) will serve one-year terms. The Aldermen decided to abandon the Office of Marshall, currently held by Russell Schmidt. The City will enter into an inter-local agreement with the Williamson County Sheriff’s Office to perform those duties. The City will join the Texas Municipal League (TML), which provides a variety of services to cities in Texas. Membership is free for the first year. Action to purchase liability insurance through TML was tabled pending receipt of a written proposal. The City will establish a Bank Depository Services Agreement with Citizens National Bank of Coupland. Action related to franchise tax revenue was tabled pending further research. No citizens signed up for the Citizen Communication portion of the meeting. Future meetings of the City Council will be on the second and fourth Thursdays of the month at 7 PM at the Coupland Volunteer Fire Department, beginning with the next meeting on July 11. The meetings on the fourth Thursdays will be optional, the necessity of which will be decided upon at the first meeting of each month. The meeting adjourned at 7:33 PM. 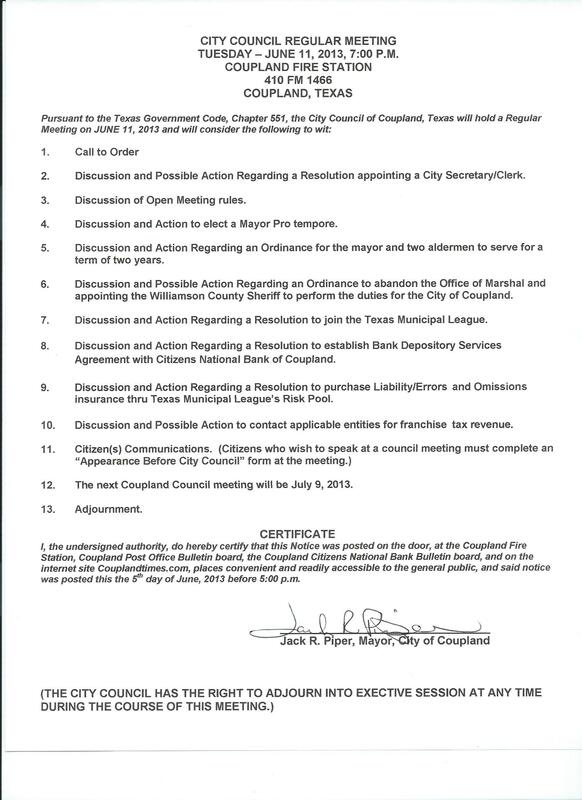 No doubt this will go down in Coupland history as its shortest City Council meeting, a testament to good preparation and efficient conduct of the meeting itself. Eventually, the City will probably have its own website. In the meantime, official notices from the City of Coupland will be posted in prominent public locations within city limits, in the Coupland Times, and in other public forums as appropriate. This entry was posted in Local Government, What's New? 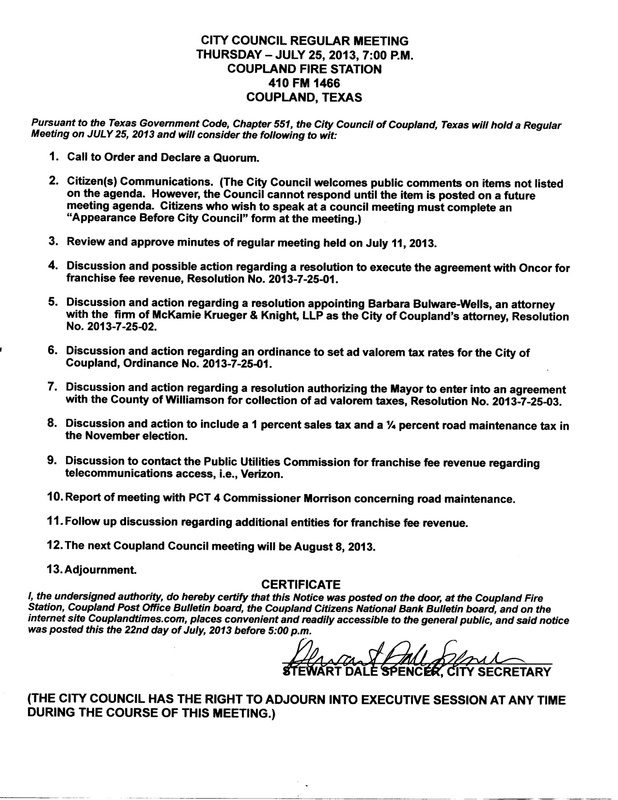 and tagged city council, Coupland Texas News, swearing in ceremony on June 12, 2013 by Stewart Dale Spencer. The first meeting of Coupland’s first City Council will be held on Tuesday, June 11 in the meeting room of the Coupland Volunteer Fire Department at 7 PM. This entry was posted in Breaking News, Local Government, What's New? and tagged city council on June 5, 2013 by Stewart Dale Spencer. 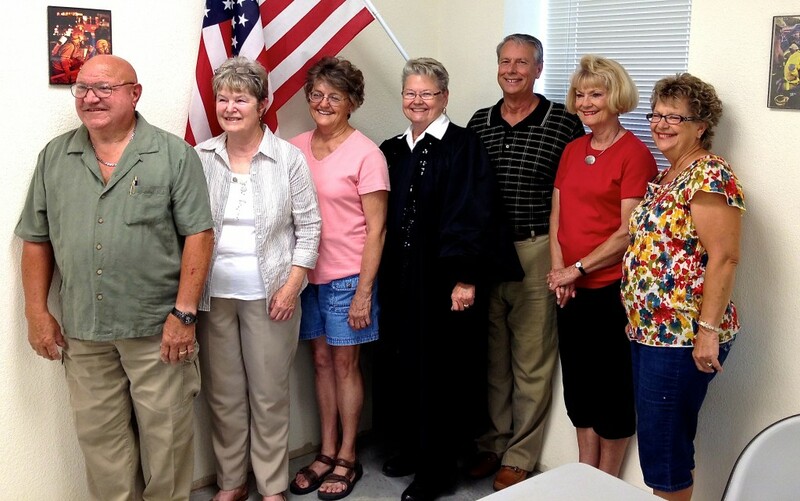 Breaking News – Coupland Elects Its First City Council! Just under one-half of the folks who voted for incorporation in November went to the polls to elect our first Mayor, Marshal, and Aldermen. * This is not surprising considering that the Mayor and Marshal positions were uncontested and that there were no controversial issues facing the six candidates for the five Aldermen positions. In their public statements to the community, all candidates stated that their motivation for running for office was their desire to help Coupland retain its character as a quiet farming and ranching community. This left voters to consider the candidates based on their qualifications and, presumably, their experiences with them in the community. Only one candidate, Karen Marosko, placed yard signs around town. Unofficial results from Williamson County, with all precincts reporting in (both of them), show Jack Piper got 100% of the 41 votes for Mayor and Russell Schmidt got 100% of the 41 votes for Marshal. As for the Aldermen, here are the results, in order, based on each candidate’s percentage of the total number of votes cast for Aldermen (206). The five persons getting the most votes will become the first Coupland City Council. 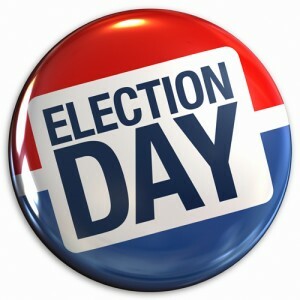 Click here for Williamson County Election Results. Our new municipal servants will be sworn in after the election is certified. It has taken a lot of work to bring Coupland to this point in its development as a community. Much work remains to be done as the new council has its initial meetings and makes decisions that will affect the community for years to come. They will need your prayers and support. The Coupland Times will keep you informed of developments in the on-going process of incorporation. I also anticipate that it will provide a forum for a discussion of various issues that may affect our community as we move into the future. *It may not be one of the most pressing matters to be tackled by our first City Council but the term “alderman” has an interesting history and is set by state law to a certain degree. It remains to be seen how it will be adapted to meet modern usage. Alderman? Alderperson? Alderwoman? This entry was posted in Local Government, What's New? and tagged city council, election, marshal, mayor on May 11, 2013 by Stewart Dale Spencer.